It’s a short hop to the moon in Elephant Joe’s space-rocket. But look! A stripy alien (his friend Zebra) is being chased by a flying saucer (the lampshade). 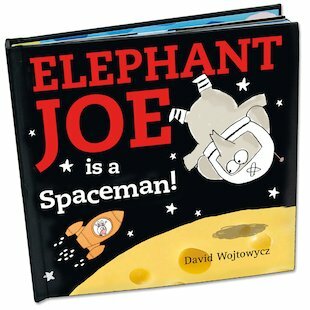 Luckily, Elephant Joe has his trusty ray gun to hand. Zap! Quick, back in the spaceship! 3-2-1: SPLASH DOWN! Just in time for a bath before bed! Brimming with imaginative play, this bold and chunky interactive fantasy has tabs, wheels and pop-ups galore. Lovely book to keep children entertained and get involved.